Ireland have announced their 22-man squad for the World Cup qualifiers against Spain and Russia later this month — naming eight players who have come through the Irish domestic league alongside 14 professionals. The increased representation from Ireland’s amateur ranks follows the recent announcement of a new selection policy, where squads for World Cup and European Championship competitions must include a minimum of 6 players that have played club rugby in Ireland. Squads for other international matches must have a minimum of 8 domestic players. Seven of the eight domestic players in the World Cup squad are also in the panel of home-based players who will face Jamaica in an international friendly at the Carlisle Grounds in Bray this Sunday. 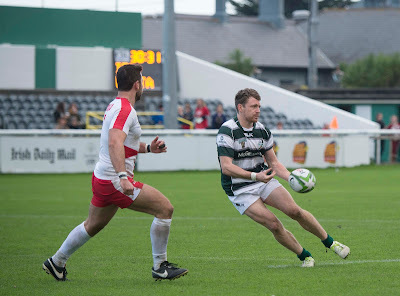 Richard Egan, Rugby League Ireland Director said: “This squad is a real testament to the quality of game that had been developing in Ireland over the last few years – not just those who have been picked but a number of domestic players who are pushing for inclusion. The back bone of the squad is made up of players from clubs in Super League and the Championship in England, and the National Rugby League in Australia. Ireland’s leading points scorer Liam Finn of the Wakefield Wildcats will captain the team in their bid to qualify for the 2017 World Cup. Other professional players returning home for the matches against Russia and Spain at the end of the month are brothers George and Toby King who alongside their team mate Joe Philbin all play for Warrington. Luke Ambler of Halifax, Scott Grix and Oliver Roberts of Huddersfield are joined by outgoing St Helens full-back Shannon McDonnell. James Hasson (Parramatta), Danny Bridge (Redcliffe Dolphins) are traveling from Australia to help secure Ireland’s qualification. "I'm looking forward to playing and captaining Ireland in the World Cup qualifiers once more," Finn said. "Nothing will surpass the pride I have to play for Ireland alongside some of my closest friends. "To qualify for next year's World Cup is our goal and to get there essential, in my opinion, for the continued development of rugby league in Ireland. "Hopefully we get the chance of a lifetime to play in Australia and I'm sure the qualifying games will live to expectation." Making up the remainder of the team are the domestic players who were selected based on their recent form in both the All Ireland League and the recent International friendlies against Italy and Malta. Leading the charge was James Kelly (pic), from the Dublin City Exiles, whose excellent form was on show last weekend where he scored a brace of tries and converted 18 points to bring his personal tally up to 26 in Ireland's 58-10 warm-up win over Malta in Bray on Saturday. Presently ranked 6th in the World Ireland will need to beat both Spain and Russia in order to qualify to play in the WC in 2017. Ireland will play matches against Jamaica (October 16th, Friendly) at the Carlisle Grounds in Bray, Co Wicklow, World Cup qualifiers against Spain (October 22nd) in Valencia, and Russia (October 29th) in Bray. The Rugby League World Cup takes place in Australia, New Zealand and Papua New Guinea next autumn.